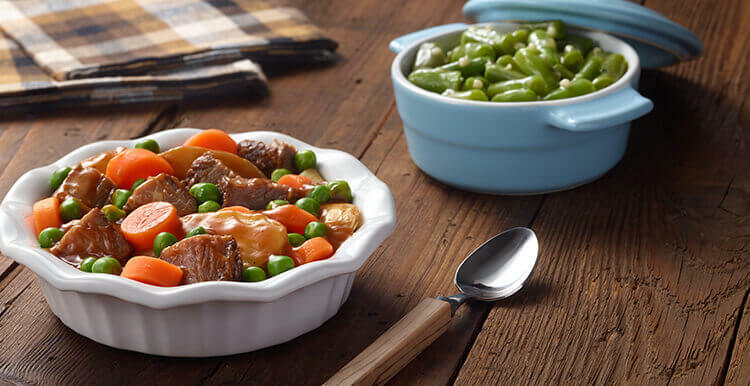 Savor tender pieces of beef with roasted Yukon Gold potatoes, carrots and peas in a savory gravy in this hearty homestyle dish. Ingredients: ROASTED YUKON GOLD POTATOES, WATER, BONELESS SEASONED COOKED BEEF PRIME RIB CUTS AND MODIFIED FOOD STARCH PRODUCT (BEEF, BEEF BROTH, CONTAINS LESS THAN 2%: MODIFIED CORN STARCH, SALT, SEASONING [TURBINADO SUGAR, SODIUM CARBONATE, SEA SALT, FLAVOR], DEXTROSE, CORN SYRUP SOLIDS, CARAMEL COLOR, SPICE EXTRACTIVES), CARROTS, PEAS, BEEF FLAVOR BASE (BEEF FLAVORINGS [BEEF, FLAVORS], SALT), BEEF FAT, MODIFIED FOOD STARCH, TOMATO PASTE, DEXTRIN, BEEF FLAVOR CONCENTRATE (BEEF BROTH [BEEF STOCK, WATER], YEAST EXTRACT, BEEF FLAVOR, CARAMEL COLOR, POTATO FLOUR, ONION POWDER, GARLIC POWDER, FLAVOR AND BEEF FAT), YEAST EXTRACT, WORCESTERSHIRE SAUCE (DISTILLED VINEGAR, MOLASSES, CORN SYRUP, WATER, SALT, CARAMEL COLOR, SUGAR, SPICES, ANCHOVIES, NATURAL FLAVOR [CONTAINS SOY], TAMARIND), BLEACHED ENRICHED WHEAT FLOUR (BLEACHED WHEAT FLOUR, NIACIN, FERROUS SULFATE, THIAMIN MONONITRATE, RIBOFLAVIN, FOLIC ACID), ONION POWDER, GARLIC POWDER, SALT, SUGAR, SPICES, CARAMEL COLOR, MONO AND DIGLYCERIDES. Nutrients: ROASTED YUKON GOLD POTATOES, WATER, BONELESS SEASONED COOKED BEEF PRIME RIB CUTS AND MODIFIED FOOD STARCH PRODUCT (BEEF, BEEF BROTH, CONTAINS LESS THAN 2%: MODIFIED CORN STARCH, SALT, SEASONING [TURBINADO SUGAR, SODIUM CARBONATE, SEA SALT, FLAVOR], DEXTROSE, CORN SYRUP SOLIDS, CARAMEL COLOR, SPICE EXTRACTIVES), CARROTS, PEAS, BEEF FLAVOR BASE (BEEF FLAVORINGS [BEEF, FLAVORS], SALT), BEEF FAT, MODIFIED FOOD STARCH, TOMATO PASTE, DEXTRIN, BEEF FLAVOR CONCENTRATE (BEEF BROTH [BEEF STOCK, WATER], YEAST EXTRACT, BEEF FLAVOR, CARAMEL COLOR, POTATO FLOUR, ONION POWDER, GARLIC POWDER, FLAVOR AND BEEF FAT), YEAST EXTRACT, WORCESTERSHIRE SAUCE (DISTILLED VINEGAR, MOLASSES, CORN SYRUP, WATER, SALT, CARAMEL COLOR, SUGAR, SPICES, ANCHOVIES, NATURAL FLAVOR [CONTAINS SOY], TAMARIND), BLEACHED ENRICHED WHEAT FLOUR (BLEACHED WHEAT FLOUR, NIACIN, FERROUS SULFATE, THIAMIN MONONITRATE, RIBOFLAVIN, FOLIC ACID), ONION POWDER, GARLIC POWDER, SALT, SUGAR, SPICES, CARAMEL COLOR, MONO AND DIGLYCERIDES.